Cheryl Hetherington in her new shirt, that her friend Loretta made fancy with some fine hand work. And oh, she loves this fabric. 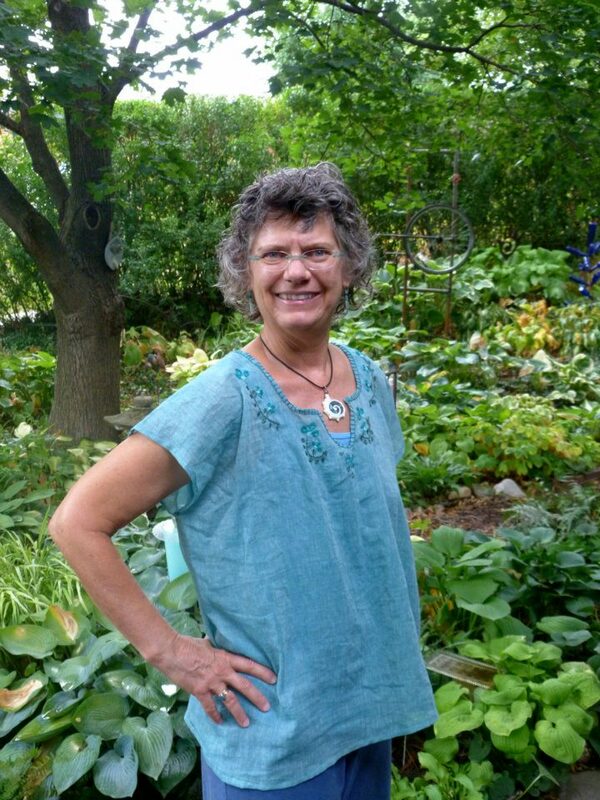 This is taken in her garden in Iowa City. What is your earliest memory about sewing or making something with fabrics? 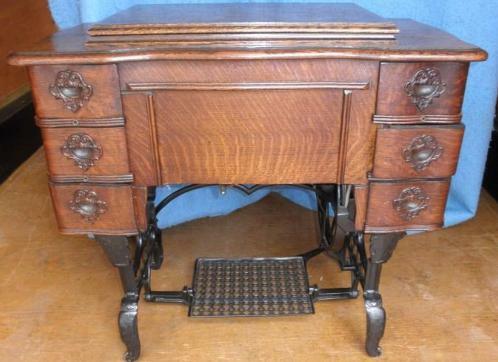 At age 12, in the early 1960’s, in Shawnee Mission, Kansas, I began to sew on my mom’s foot treadle machine. Looked a lot like the one in the picture. I first made a pencil skirt from a Simplicity pattern. 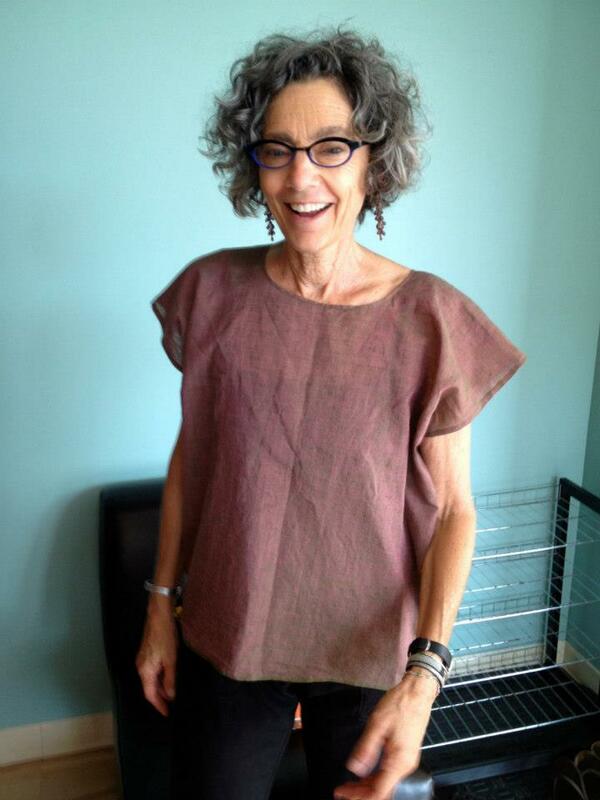 What originally gave you the idea about making summer clothes with natural fabrics?And how do you make them? I have always admired the beautiful flowing, light Indian fabrics that I have seen in my travels, especially in Thailand and Mexico. When my friend said she wanted a tunic that was thin and cool to go over her yoga capris… the search for fabrics began and I discovered FabricTreasury! This time I found a pattern I liked. Sometimes I use a piece of clothing that I bought during my travels. How often do you turn to home sewn surprises for your family and friends? Rarely really, since I have interest in so many kinds of artwork. Right now, I am really enjoying this meditative sewing time when the beastly heat keeps me inside. Do you often see something nice in the dress shop and wish if it was in a different material or fabric? Often yes, and I wear mostly natural fabrics and loose clothing. Do you stitch from patterns? Which are your favorite patterns? I like Vogue patterns quite a bit. Do you buy fabrics and stash it away for a future project? Very often! We bought many yards of silk fabric in Thailand in 2006, and I just used the last of it this summer. Which are your most favorite fabrics and what do you see yourself making with them? Natural fabrics, cotton, linen, silk. I make lots of blouses! Do you shop online for fabrics? What do you like most about online fabric shops? Actually, I just started looking online in the last few months. Though I have sewn most of my life, I have never enjoyed American fabric shops…so online shopping is very appealing, especially since you responded so quickly, clearly and honestly about the fabrics. 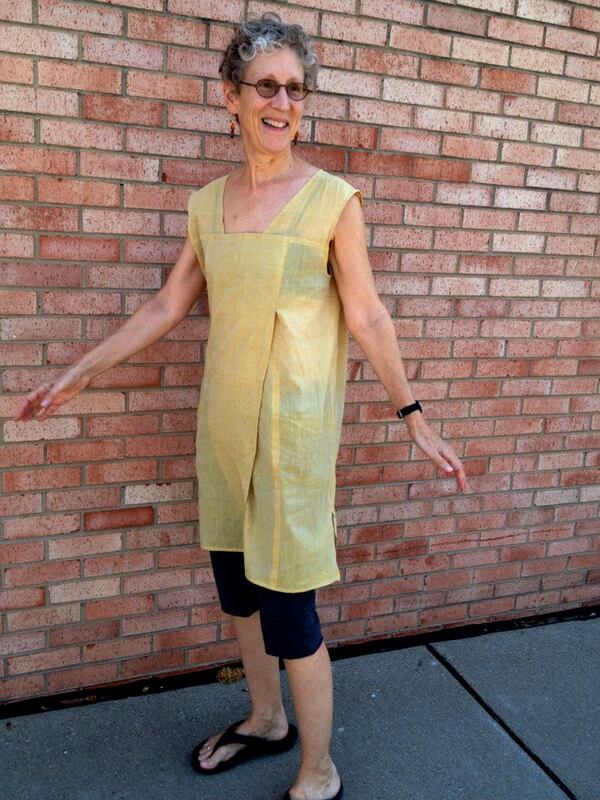 My friends so love the tunics that I am making more and more, probably up to 9 so far. This week, two of us will go to a local fabric store in Iowa City, Iowa and get some quilting fabrics for tunics. Though not a wonderful as your fabrics, it will have to do, until the next batch of your light cotton fabrics arrive! 🙂 Hurry please! Cheryl Hetherington writes from Iowa: My friend Nancy is leaving soon to teach in Hong Kong and then tour in China. She wanted a light shirt that packs small and looks beautiful. So here she is in a shirt I made her from the fabric that I got from you. Nice, eh! This entry was posted in Sew n Show. Bookmark the permalink.